Rapid, sensitive and precise probe-based qPCR detection and quantitation of target RNA targets. The NEB Luna Universal Probe One-Step RT-qPCR Kit is optimized for real-time quantitation of target RNA sequences using hydrolysis probes. One-Step RT-qPCR provides a convenient and powerful method for RNA detection and quantitation. In a single tube, RNA is first converted to cDNA by a reverse transcriptase, and then a DNA-dependent DNA polymerase amplifies the cDNA, enabling quantitation via qPCR. 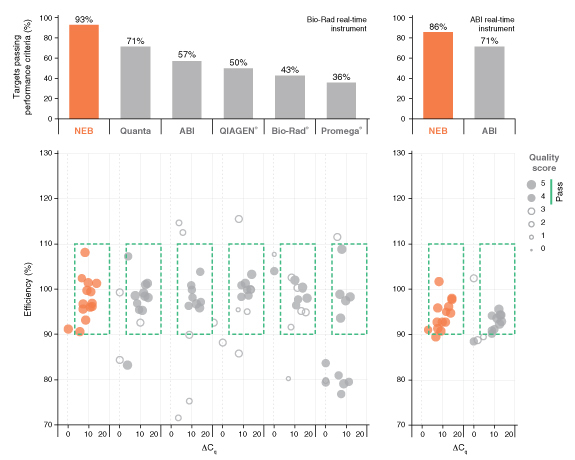 Probe-based qPCR/RT-qPCR monitors an increase in fluorescence upon 5´ → 3´ exonuclease cleavage of a quenched, target-specific probe to measure DNA amplification at each cycle of a PCR. At a point where the fluorescence signal is confidently detected over the background fluorescence, a quantification cycle or Cq value can be determined. Cq values can be used to evaluate relative target abundance between two or more samples, or to calculate absolute target quantities in reference to an appropriate standard curve derived from a series of known dilutions. In the Luna Universal One-Step Probe RT-qPCR Kit, Hot Start Taq DNA Polymerase is combined with a novel WarmStart-activated reverse transcriptase, allowing dual control of enzyme activity via reversible, aptamer-based inhibition. This temperature-dependent activation helps to prevent undesirable non-specific priming and extension prior to thermocycling, providing added security for setting up reactions at room temperature. The engineered WarmStart Luna Reverse Transcriptase also possesses higher thermostability than many other RTs, allowing an optimal reaction temperature of 55°C. For difficult targets/templates, higher RT step temperatures of up to 60°C can be used without compromising Luna performance. Note that to ensure full activation of the WarmStart Luna RT, incubation at temperatures lower than 50°C is not recommended. The Luna Universal Probe One-Step Reaction Mix is supplied at 2X concentration and contains Hot-Start Taq DNA Polymerase, dNTPs, and all required buffer components. It is formulated with a unique passive reference dye that is compatible across a variety of instrument platforms, including those that require a high or low ROX reference signal. The Reaction Mix also features dUTP for carryover prevention and a non-fluorescent visible dye for monitoring reaction setup. This visible dye does not overlap spectrally with fluorophores commonly used in qPCR and does not interfere with real-time detection. The Luna WarmStart RT Enzyme Mix is supplied at 20X concentration and contains Luna WarmStart Reverse Transcriptase as well as Murine RNase Inhibitor to aid in preventing RNA degradation (see also template preparation in product manual). It is compatible with various RNA sample types (total RNA, poly(A)-RNA, etc.) and sources. RT-qPCR targeting human GAPDH was performed using the Luna Universal Probe One-Step RT-qPCR Kit over an 8-log range of input template concentrations (1 μg – 0.1 pg Jurkat total RNA) with 8 replicates at each concentration. Reaction setup and cycling conditions followed recommended protocols, including a 10-minute RT step at 55°C for the thermostable Luna WarmStart Reverse Transcriptase. Multiplex RT-qPCR targeting human GAPDH, ribosomal protein L32g and PI3-Kinase-Related Kinase SMG1 was performed using the Luna Universal Probe One-Step RT-qPCR Kit over a 7-log range of input template concentrations (1 μg – 1 pg Jurkat total RNA) with 4 replicates at each concentration. Amplification plots are shown both overlayed (left) and for each multiplex target (right). To account for copy number differences, 0.4 µM primer was used for lower-copy target (SMG1) and 0.2 µM primer for higher-copy targets (L32g and GAPDH). Luna maintains superior efficiency, reproducibility, sensitivity and performance in multiplex RT-qPCR. Commercially-available RT-qPCR reagents were tested on 7 RT-qPCR targets varying in abundance, length, and %GC. Data was collected by 2 users and according to manufacturer’s recommendations. Results were evaluated for efficiency, low input detection and lack of non-template amplification (where ΔCq = average Cq of non-template control – average Cq of lowest input). In addition, consistency, reproducibility and overall curve quality were assessed (Quality Score). Bar graph indicates % of targets that met acceptable performance criteria (indicated by green box on dot plot and Quality Score > 3). Results for NEB and other suppliers are shown: Quanta, qScript™ XLT 1-Step RT-qPCR ToughMix®; ABI, TaqMan® RNA-to-Ct 1-Step Kit; QIAGEN, QuantiFast® Probe RT-PCR Kit; Bio-Rad, iTaq™ Universal Probes One-Step Kit; Promega®, GoTaq® Probe 1-Step RT-qPCR System. NEB’s Luna Universal Probe One-Step RT-qPCR Kit outperformed all other reagents tested. Learn more about our comprehensive qPCR/RT-qPCR testing and “dots in boxes” data visualization. The use of qPCR primer design software (e.g., Primer3) maximizes the likelihood of amplification success while minimizing nonspecific amplification and primer dimers. Targets with balanced GC/AT content (40–60%) tend to amplify most efficiently. Where possible, enter sufficient sequence around the area of interest to permit robust primer design and use search criteria that permit cross-reference against relevant sequence databases (to avoid potential off-target amplification). It is advisable to design primers across known RNA splicing sites in order to prevent amplification from genomic DNA. For most targets, a final concentration of 400 nM (each primer) will provide optimum performance. If needed, primer concentrations can be optimized between 100–900 nM. Probe should be included at 200 nM for best results. Probe concentration can be optimized in the range of 100–500 nM. When determining which fluorophores to include in a multiplex reaction, be sure to choose compatible reporter dyes and quenchers (e.g., those that can be accommodated by the chosen real-time instrument with minimal overlap in fluorescence spectra). For ROX-dependent instruments, avoid ROX-labeled probes. Include 400 nM of forward and reverse primers and 200 nM probe for each target to be detected in the reaction. For targets that differ significantly in abundance, use of a lower primer concentration (e.g. 200 nM) for the more abundant target(s) is recommended. Adjust concentrations if necessary based on performance (primer 100–900 nM, probe 100–500 nM). When loading a qPCR protocol onto the real-time instrument, be sure to select the appropriate optical channels, as some instruments have a single channel recording mode that would prevent multiplex data collection and analysis. The functionality of the primer and probe sets should be tested individually before attempting a multiplex reaction. To ensure successful and consistent qPCR results, it is important to maximize PCR efficiency. An important aspect of this is the design of short PCR amplicons (typically 70–200 bp). Some optimization may be required for targets that exceed that range. Luna RT-qPCR is compatible with RNA samples prepared through typical nucleic acid purification methods. Prepared RNA should be stored in an EDTA-containing buffer (e.g., 1X TE) for long-term stability, and dilutions should be freshly prepared for a qPCR experiment in either TE or water. Note that the quality of RNA templates can greatly affect RT-qPCR efficiency. RNA should be handled with appropriate precautions to prevent RNase or DNase contamination. Use of nuclease-free water (provided) is strongly recommended. Where useful, RNA may be treated with DNase I to remove contaminating genomic DNA. Generally, a useful concentration of standard and unknown material will be in the range of 108 copies to 10 copies. Note that for dilutions in the single-copy range, some samples will contain multiple copies and some will have none, as defined by the Poisson distribution. 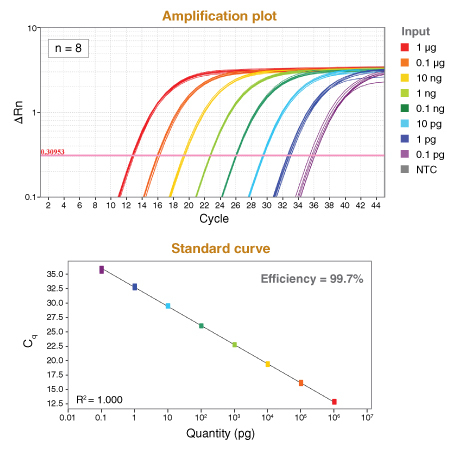 For total RNA, Luna One-Step Kits can provide linear quantitation over an 8-order input range of 1 μg – 0.1 pg. For most targets, a standard input range of 100 ng – 10 pg total RNA is recommended. For purified mRNA, input of ≤ 100 ng is recommended. For in vitro-transcribed RNA, input of ≤ 109 copies is recommended. Some real-time instruments recommend the use of a passive reference dye (typically ROX) to overcome well-to-well variations that could be caused by bubbles, small differences in volume, and autofluorescence from dust or particulates in the reaction. Luna mixes are formulated with a universal reference dye that is compatible with a variety of qPCR instrument types, including those that use no passive reference normalization and those that use a low or high concentration of passive reference dye (ROX). Therefore, no additional components are required to ensure compatibility with these instruments. RT-qPCR is an extremely sensitive method, and contamination in new RT-qPCR assays with products from previous amplification reactions can cause a variety of issues, such as false positive results and a decrease in sensitivity. The best way to prevent this “carryover” contamination is to practice good laboratory procedures and avoid opening the reaction vessel post amplification. However, to accommodate situations where additional anti-contamination measures are desired, Luna qPCR mixes contains a mixture of dUTP/dTTP that results in the incorporation of dU into the DNA product during amplification. Pretreatment of qPCR/RT-qPCR experiments with uracil DNA glycosylase (UDG) will eliminate previously-amplified uracil-containing products by excising the uracil base to produce a non-amplifiable DNA product. The use of a thermolabile UDG is important, as complete inactivation of the UDG is required to prevent destruction of newly synthesized qPCR products. To enable carryover prevention, 0.025 units/μl Antarctic Thermolabile UDG (NEB #M0372) should be added to the reaction mix. To maximize elimination of contaminating products, set up the qPCR experiments at room temperature or include a 10 minute incubation step at 25°C before the initial denaturation step. Due to dual hot-start feature of Luna One-Step Kits, it is not necessary to set up reactions on ice or preheat the thermocycler prior to use. For 96-well plates, a final reaction volume of 20 μl is recommended. For 384-well plates, a final reaction volume of 10 μl is recommended. When programming instrument cycling conditions, ensure a plate read is included at the end of the extension step, and a denaturation (melt) curve after cycling is complete to analyze product specificity. 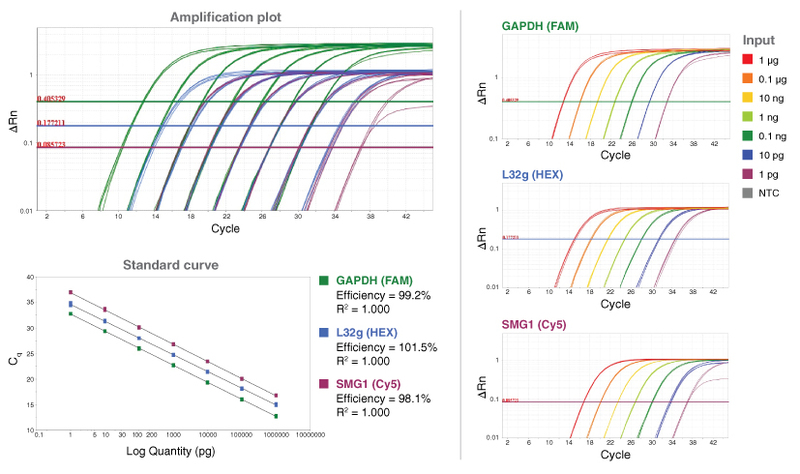 Amplification for 40 cycles is sufficient for most applications, but for very low input samples 45 cycles may be used. How do I use qPCR to determine the concentration of my material? Can I set up my Luna® RT-qPCR at room temperature? What is the difference between probe- and dye-based versions of the Luna® qPCR Mixes? Should I use probe- or dye-based detection for my qPCR assays? How should I design primers for Luna® qPCR? How long should my amplicon be for qPCR? Why is the Luna® qPCR Mix blue? Will this dye interfere with detection? Can I run the Luna® qPCR Mix on my qPCR instrument? Can I use fast cycling conditions with the Luna® qPCR Mix? Do I need to add ROX? How many dilutions should I use to make a standard curve? Why does NEB recommend 40-45 cycles? Does the Luna® qPCR Mix contain dUTP? Can I use carryover contamination prevention methods? Can I run multiplex reactions with the Luna® Universal Probe RT-qPCR Kit? Do I need to change my reaction conditions? Can I use a ROX-labeled probe with the Luna® Probe Mix? Can alternative probe based detection strategies be used with the Luna® Probe Mix? How much primer and probe should I use with the Luna® Universal Probe RT-qPCR Kit? How do I choose between one-step RT-qPCR and two-step RT-qPCR? What RNA samples can be used in qPCR with the Luna® Mix? How much RNA template should I use in my RT-qPCR reaction? Can I use longer targets in one-step RT-qPCR? What temperature should I use for cDNA synthesis with Luna® RT-qPCR kits? Should I include a no Luna® WarmStart® Enyzme Mix control (-RT Control)? Can I use shorter cycling times? Notice to Purchaser: Nucleic-acid based aptamers for use with thermophilic DNA polymerases are licensed exclusively by New England Biolabs, Inc. from SomaLogic, Inc. (See Patent Nos. 5,474,096; 5,670,637; 5,696,249; 5,874,557; and 5,693,502). New England Biolabs, Inc. gives the Buyer/User a non-exclusive license to use the aptamer-based Luna® Universal Probe One-Step RT-qPCR Kit for Research Purposes Only. Commercial use of the aptamer-based Luna® Universal Probe One-Step RT-qPCR Kit requires a license from New England Biolabs, Inc. Please contact [email protected] for more information. BIO-RAD® and ITAQ® are registered trademarks of Bio-Rad Laboratories. GOTAQ® is a registered trademark of Promega Corporation. QIAGEN® and QUANTIFAST® are registered trademarks of Qiagen, Inc.
QSCRIPT™ is a trademark of Quanta. QUANTSTUDIO® is a registered trademark of Life Technologies Corporation. STEPONEPLUS® is a registered trademark of Applied Biosystems, LLC. TOUGHMIX® is a registered trademark of Quanta. TAQMAN® is a registered trademark of Thermo Fisher Scientific.